Hip-pity Hop-pity Easter's on it's way! Hello Friends! 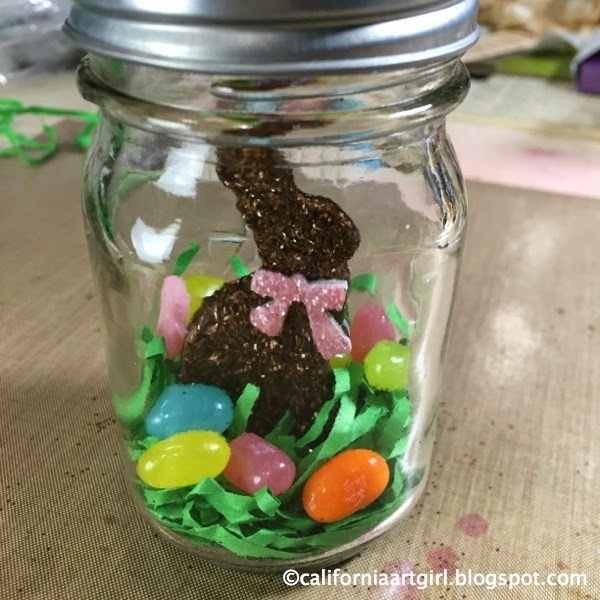 Easter will be here before you know it, so here is a quick and easy project for the little ones! I know my grandchildren are going to love these. 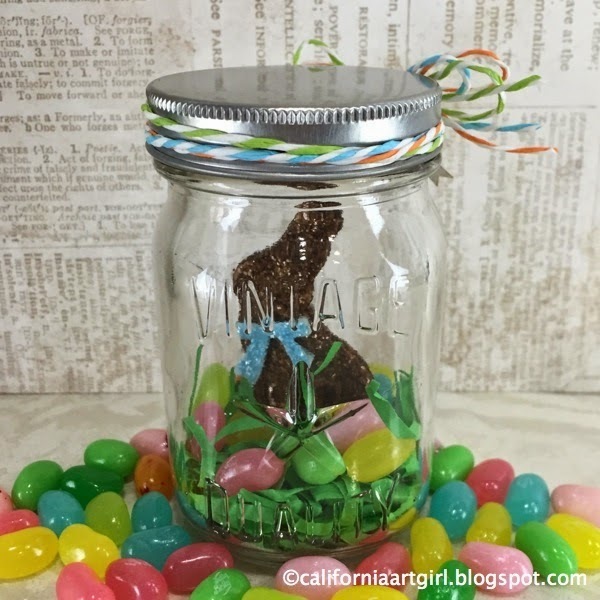 These new Mini Mason Jars are not only great for storage they are perfect for fun projects like this one! 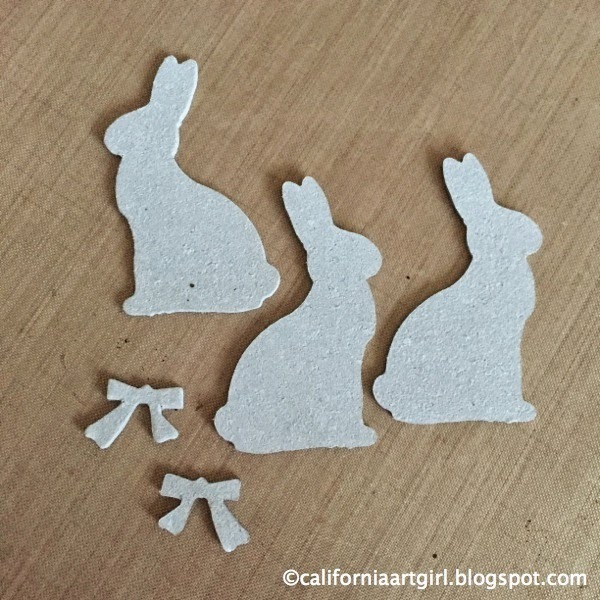 Die cut 3 Mini Bunnies and 2 little bows from Grungeboard or chip board. Adhere the three bunnies together leaving the bottom 1/4" unglued. This will allow the bunny to fit in to the label clip later. 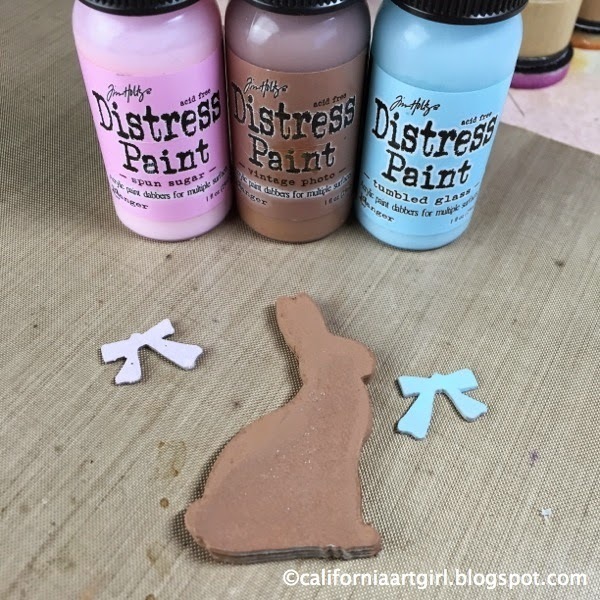 Paint the bunny and bows with Distress Paint and let dry. Apply a generous amount of Glossy Accents and spread out with your finger. Cover the entire bunny and the bows. 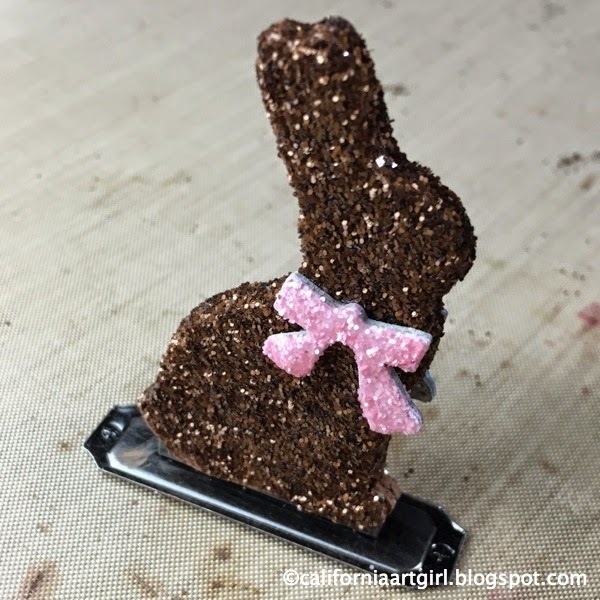 Pour the glitter over the bunny and bows and shake off the excess. 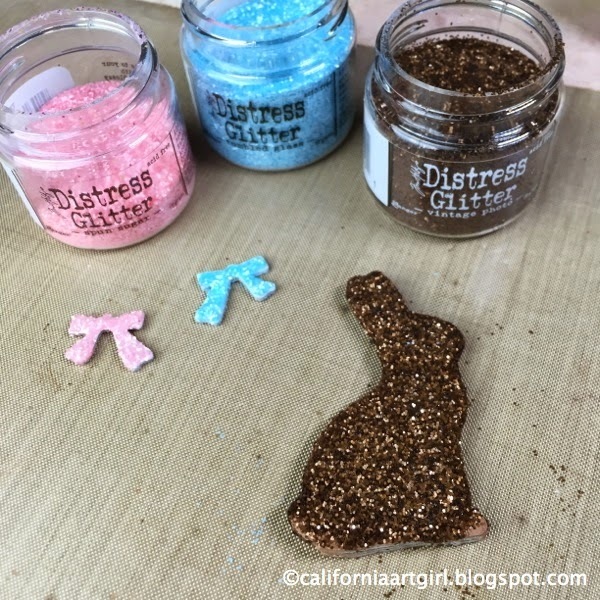 Do one side of the bunny, the sides and let it dry…then turn over and glitter the other side. Love the sugar coating it's almost good enough to eat. Adhere the little bows on both sides of the bunny. Insert bunny in to the back of the Label Clip. You may need to squeeze the tabs together with pliers to hold the bunny. The Label Clip acts as a little stand in the Mini Mason Jar. 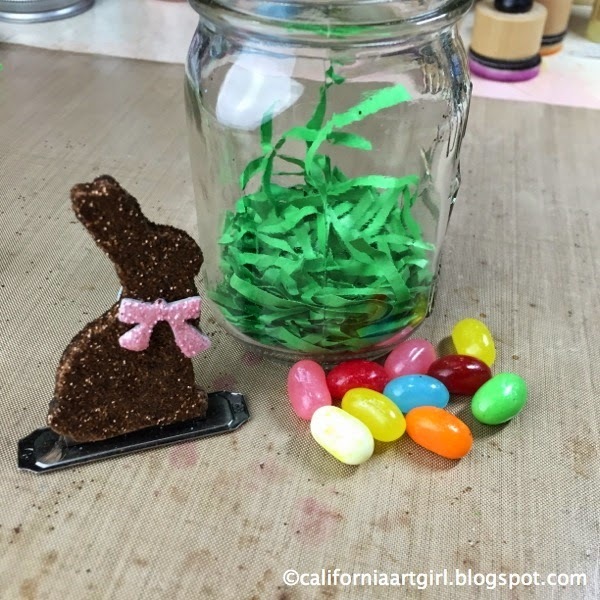 Put a little grass in the bottom of the Mini Mason Jar. 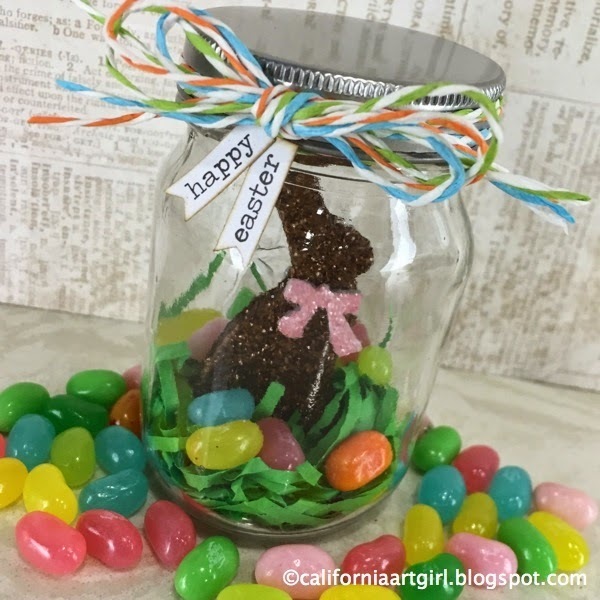 Add the Bunny and some jellybeans. Place the cap back on to the jar. 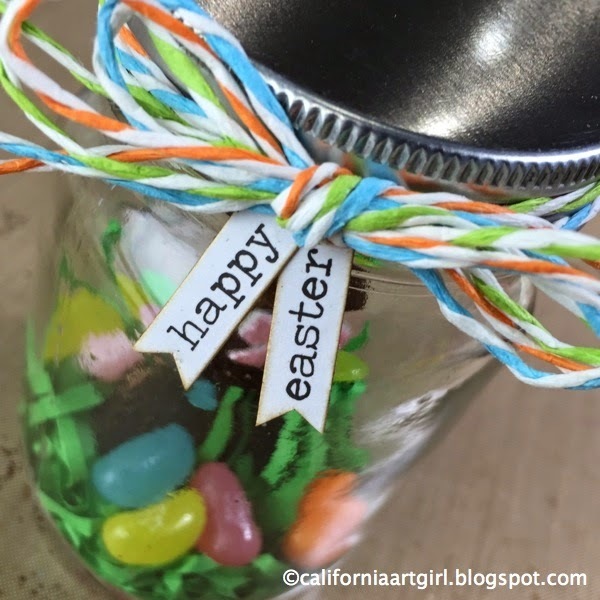 Tie a bow with Stripped Paper String around the lid of the jar. Choose a few words from Seasonal Chitchat and adhere just under the bow. Cut a "V" out of the end to make little banners. 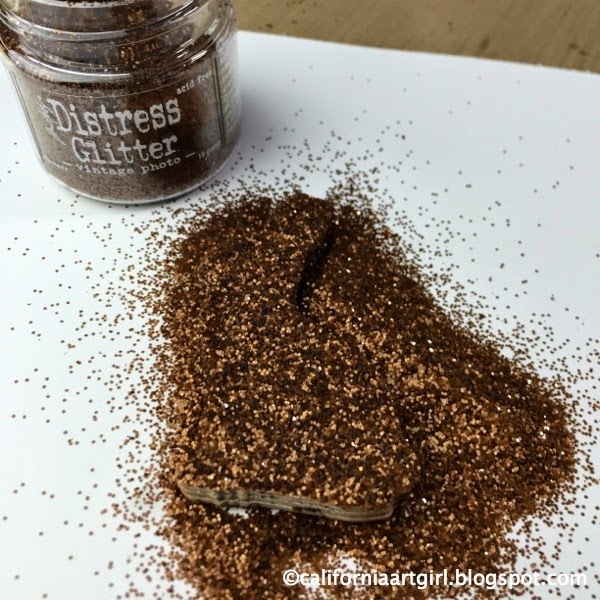 Don't forget to distress the edges with Distress Ink on an Ink Blending Tool. Pink bow for the girls…..
or a blue bow for the boys! Such a fun project! I think the kids would have fun making these too. 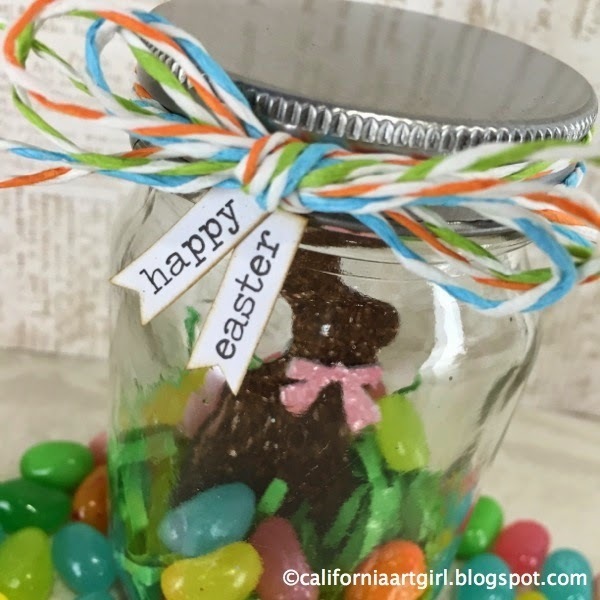 I have a confession…..I bought the jellybeans for this project and they sat on the kitchen counter for a few days. As soon as I opened them to add the jellybeans to my project I ate and ate and ate till the whole bag was almost gone. Yummy!!! Here's all the products I used! It's not just a "Trophy Cup" It's so much more! 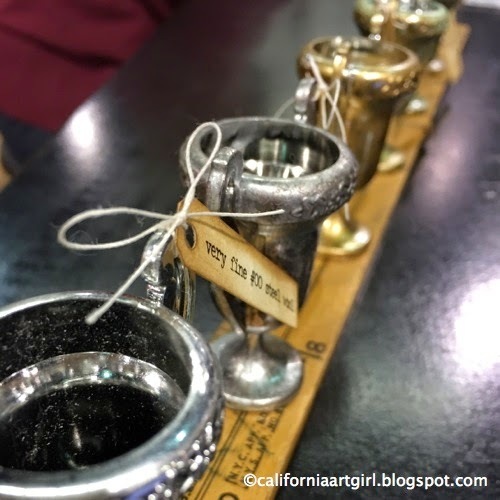 Hi Friends…Today is all about these little gems…the new Trophy Cups! 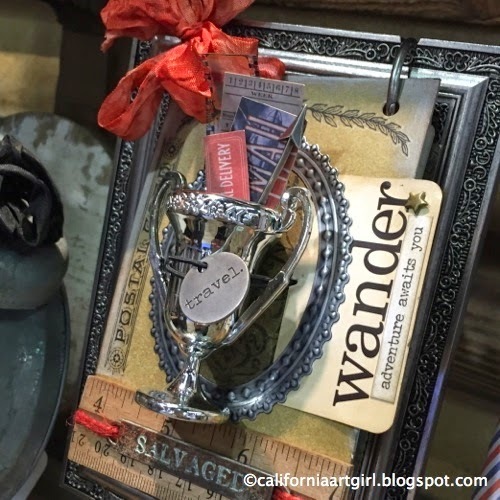 You can use them in so many different ways…like this cute little photo holder. 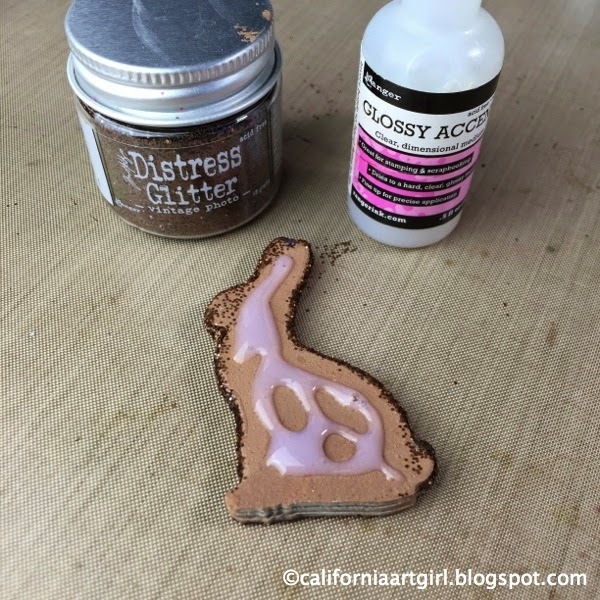 Cover a 3/4" styrofoam ball with a little moss and then hot glue it in to the Trophy Cup. Paint a big number from the Alpha Parts Numeric with Distress Paint. Before the paint dries wipe off the excess paint. Adhere the number to the handle. Add an Index or Vial Labels to the front of the Trophy then adhere a Mirrored star over the label. The smaller labels are the perfect size for the front of the Trophy. letters. Add a little Small Talk to the photo and don't forget to ink the edges with Distress Ink on an Ink Blending Tool. Next add a little Linen Ribbon bow and a paper flower. 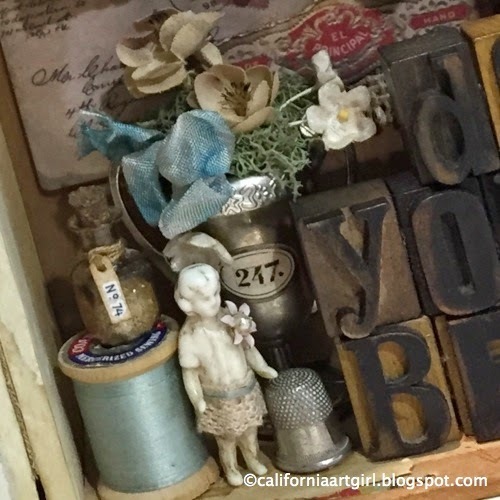 This paper flower was made from the new Alterations die Tiny Tattered Florals. Trophy Cups come in a three pack and retail for around $3.00 and that's practically free...right! The Trophy Cups can be altered in many ways. Using steel wool gives the trophies a matte finish, alcohol inks and distress paint add color and also work well together. 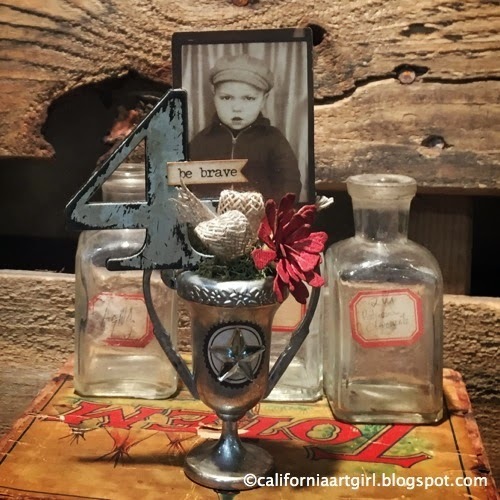 This piece was done by Paula Cheney, she added the Trophy Cup to an assemblage and then tossed in a few vintage flowers for the finishing touch. So very sweet! 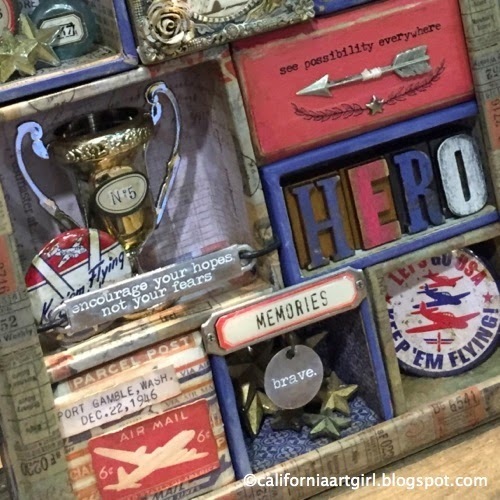 Cheiron Brandon made this fun patriotic Configurations Box and used the Trophy Cup as an award. And this is so brilliant Vicki Bouton attached her Trophy Cup with an Elastic Bands to the front of the Flip Frame. So…so…very brilliant! 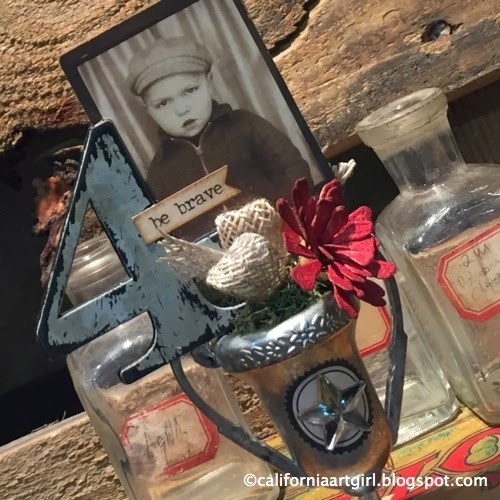 What will you make with your Trophy Cup?? Thank you for stopping in, I always appreciate your time.